This beautiful girl has been at DEVORE too long. 7/10/18! She’s a spayed a nine-year-old female !!!! look how beautiful and friendly she is please share so she can get a home she’s at DEVORE San Bernardino County shelter please call 909-386-9820 if you can help her!! Lovely in every way.. what’s not to adore about this beauty? She would be such an awesome family addition.. Gentle, sweet and attention seeking. She is available for adoption. As she got the news, clinging to her volunteer, to find comfort in the only thing that makes her happy. Sad indeed. This girl wants so badly to be a lap dog. She will make someone such a loyal companion. I am a spayed female, tan and black German Shepherd Dog. The shelter staff think I am about 9 years old. I have been at the shelter since Jul 10, 2018. 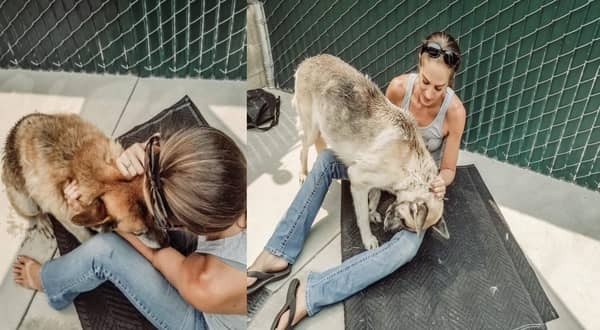 6 Responses to "Senior GSD clings to her favorite volunteer as she got the news formally placed on death row"
Why don't these posts update??????? I POSTED YESTERDAY ASKING IF THIS PUP CAN BE TRANSPORTED OUT OF STATE. NOT KNOWING IF HER HEALTH WILL ALLOW OR THIS SHELTER ALLOWS TRANSPORT OUT OF STATE. SOME DO NOT WHICH I FIND RIDICULOUS BECAUSE THEY'D RATHER KILL THEM THAN LET THEM LIVE OUT THEIR LIVES OUTSIDE OF A CERTAIN RADIUS OF THEIR SHELTERS. I NEVER SAW THAT POSTING WHERE I ASKED MY QUESTIONS ON HERE EITHER. WANT THE PUP NOT TO BE KILLED AND PRAYING AND HOPING FOR SOME KIND OF MIRACLE THAT SHE IS NOT. INCREDIBLY SAD. I'M IN MICHIGAN AND SURE THEY WON'T ALLOW HER TO TRAVEL HERE. ASKING JUST IN CASE IT'S DOABLE!!! I wonder the same thing many times. We're in Alabama and I think the trip from the west coast would be too hard for many of them. CALL THE DEVORE SHELTER AND ASK!!! I AM SURE IF U PAID FOR THE TRANSPORT, IT IS POSSIBLE. The trip by automobile would not be hard on those two dogs withhold dogs you travel slower you stop more make sure they eat and can eliminate and it's just a nice time for them as long as you there never left alone in the car of course but the seats should be down they shouldn't be on the seats. and of course the shelter would let them go to a home or caregiver out of state that's better than euthanizing them. What existing health issues do they have other than what elderly dogs all get in general? I don't understand how the owner did this to these two dogs.